My First Chomp in the Swamp winner Alura Romero is a UF Online senior majoring in telecommunication. She and her husband Alex visited Gainesville from Virginia Beach to enjoy a campus tour and their first Gator football game. Here, Alura recaps her experience. Who is Gator royalty? When you think of who ‘rules the school’ at the University of Florida, who do you think of? Do you think of the football players whose faces are aired on ESPN weekly? Do you think of the football coach, who is essentially the face of the team, leading one of the top-ranked football programs? Do you, maybe, think of the dean of each college as royalty? Or do you think of the president of the university as royalty? If you thought of any of these people, you thought wrong. This weekend, I found out a very reassuring and inspirational fact --- the students are Gator royalty. The students rule the school. I was lucky enough to win an all-expenses paid trip to Gainesville this past weekend for My First Chomp in the Swamp. I had never been to a Gator football game before and there was a contest in which seven people who had never been to a Gator football game before would be chosen to attend their first game. I won. This past weekend was one I will never ever forget. I met with my academic advisor, who I had only conversed with via email, and she took my husband and I on a tour of Weimer Hall. I got a glimpse of what college life is like on campus, and it’s beautiful. It was awe-inspiring to see what the students create at Weimer Hall, between seeing the WUFT newsroom, The Agency, and GHQ. I couldn’t stop thinking, “this is my school.” These places lit an educational-fire in my soul that hasn’t dimmed since. After getting a personal tour from my advisor, we all went out to dinner at The Swamp Restaurant. I’d been wanting to visit this restaurant for the longest time. Everyone I knew told me, you haven’t been to Gainesville until you’ve gone to The Swamp Restaurant. We ordered Gator Tail and all tried it for the first time. It wasn’t horrible. I probably wouldn’t order it again, but it was the experience that meant the world to me. On Saturday, we were on our way to our first UF football game! Throughout the day, I high-fived Gator football players while they were on the field on their way to the locker room. I chomped it up with Athletic Director Scott Stricklin and shook hands with Coach McElwain. 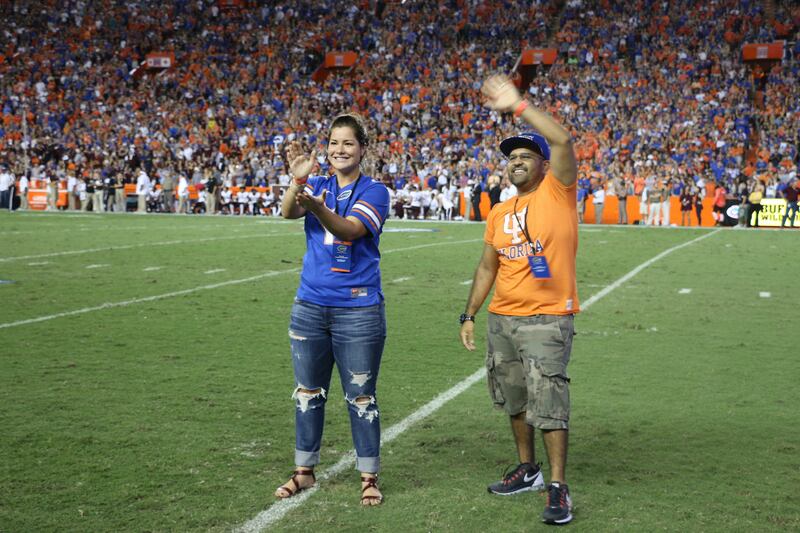 We were able to stay on the field during the first quarter of the football game and we ended up being on the jumbotron as a “welcome Alura Romero to the Swamp” type of deal (yes, it was nerve-wrecking, but also the greatest experience I’ve ever had in my life). Lastly, we were taken up to the President’s Suite. In the suite, I met with the Dean of my college, Diane McFarlin, who was down-to-earth and easy to talk to. I also talked with UF President Kent Fuchs. How willing he was to talk with me, a student who doesn’t even attend class on campus but lives hundreds of miles away. As online students, it’s easy to get lost in the mundane activities that surround our lives wherever we are at. It’s easy to believe that to the university, you are just another number. I am here to tell you – that’s not true! This weekend showed me that students are the real royalty of the University of Florida, not the faculty members and not the football players who are the celebrities of the school. We, the students, are the true royalty of the University of Florida. To read more about the contest and the winners, check out the UAA website.